Onosma fruticosum is an erect, much-branched hairy shrub 15-90 cm high of the family Boraginaceae. The flowers are nodding, golden-yellow fading to orange brown with age. 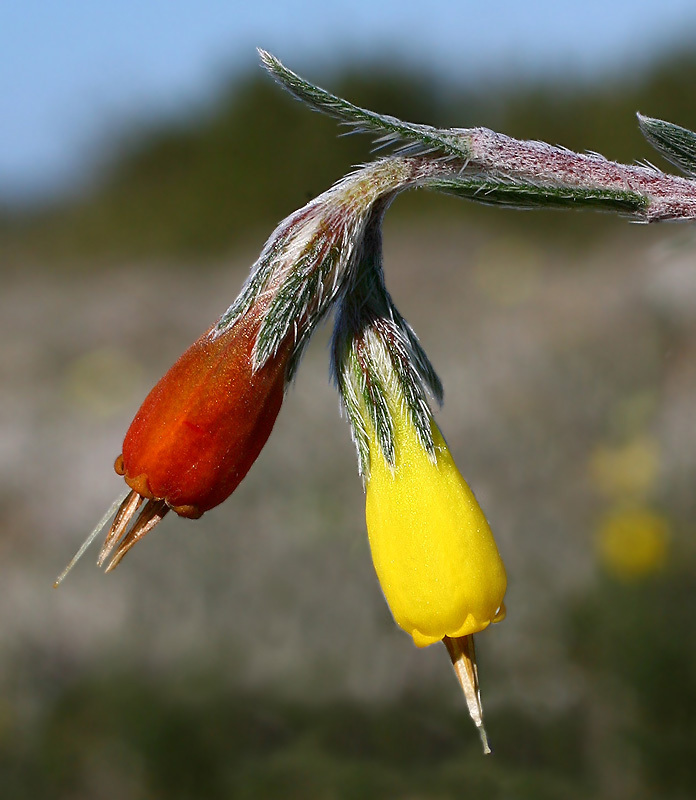 It is a common endemic species of Cyprus found on rocky soils in sunny spots in costal and lower mountainous areas. Splendid photo of this beautiful endemic Flower, TFS! really beautiful flowers. Amazing colours. Perfect sharpness exactly on the object. Very nice point of view. Peaceful background. What a wonderful and interesting pic showing this strange flowers completely unknown for me.Thanks for sharing and for the instructive note. Ciao George. Great compo brilliant colour and very good light.Excellente sharp. Absolutely strange plant indeed friend Christodoulos! Good evening! The contrast of yellow and red is fantastic. Impressive sharpness and very good details for this flower. Fantastic composition. Splendid natural colors and excellent composition.Wonderful,wonderful,wonderful!!! Excellent and very beautiful photo in splendid contrasting colours and amazing sharpness. Very good choice of composition. Great DOF. Fantastic macro taken from the best light corner and whit the usual impressive quality of sharpness and colors.Very interesting this specie,it's a first time for me!Thanks for share,have a nice day,Luciano. καλή σου μέρα Χριστόδουλε, χαίρομαι για τη δύναμη της φωτογραφίας, φόντο(το bokeh) που ανδεικνύει πολύ καλά το θέμα με τα δύο χρώματα τόσο καλά αποδοσμένα να δημιουργούν μια πολύ εντυπωσιακή ευκρινέστατη σκηνή! Wonderful photo. Fantastic colors dualism on one stalk. Super sharp. Sarı ve kırmızı renklerden oluşan bu harika �i�eği ilk kez g�r�yorum. Renkler ve detaylar �ok başarılı �ekilmiş. Tebrikler. An excellent macro of these interesting flowers in different colours. Old age is very beautiful here too!! A fine composition with great focus on the flowers against the soft background. Very interesting colors of the flower, as you explained its wonderful to capture like this, beautiful image. tfs. Outstanding clarity, focus and fantastic sharpness. The colors are natural and very nice. Excellent macro with such impressive details. what an nice and interesting flower. Exellent sharpness, pos and details. This are an for me unknow specie. A beautiful composition captured with amazing details and excellent sharpness. I also like natural colours. Well done! Amazing the different colors of the flowerheads, most beautiful these beautiful shades turning from yellow to orange-brown. Very well seen and presented. Lovely and ideal fine background. A picture full of light and elegance. very special capture n two wonderful colours. The clarity and sharpness is excellently rendered. How exciting to see the hairy stalks and the well defined yellow and red! Very beautiful composition, great colors and clarity!!! Amazing capture with two similar fruits with different contrasting colors captured so well in the frame. Fine macro and thanks for sharing.